I am pleased to announce that I have passed my exams and am now a certified fitness nutritionist specialist! I hope you don’t mind if I start posting more blogs on nutrition as well as exercise and yoga. Proper diet and exercise go together and it is not possible to be truly fit and healthy without a combination of both. That being said, there is a lot of information about food that is not based on sound scientific principles and they are mostly shared with the intent to sell a particular supplement or diet. Some dietary information is shared because it worked for one particular person but it may not necessarily be the right diet for other types of people. Since I have no other motive than to help people reach their goals in the most healthy way possible, I hope to give you the most unbiased information on nutrition I can. 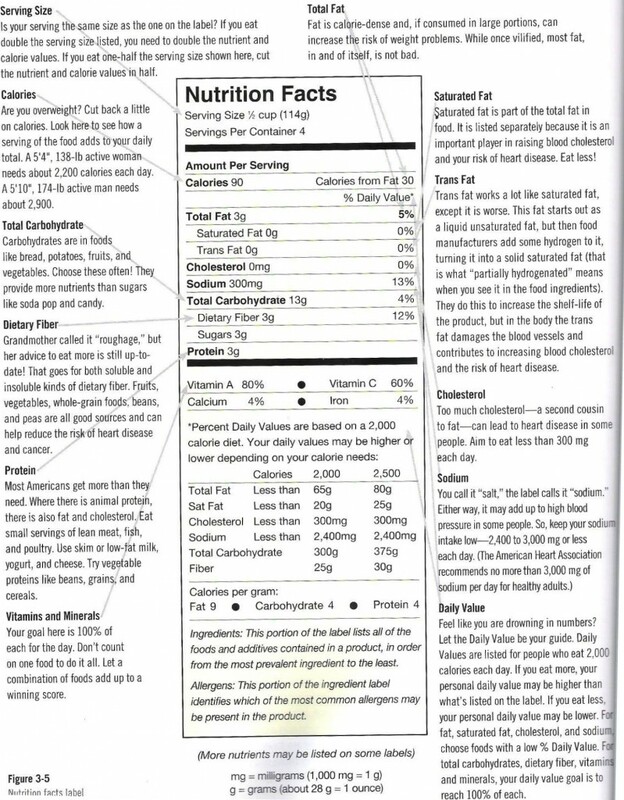 I’m writing this post on reading labels because nutrition and food labels can be very misleading and if you aren’t an expert on the subject, you are likely to garner the wrong information from them. Also, studies have shown that many people do not reach their goals simply because they don’t know what they’re doing. They might think they are eating something that is good for them when it actually is not. Proper education on what is in the food you buy is integral to success. 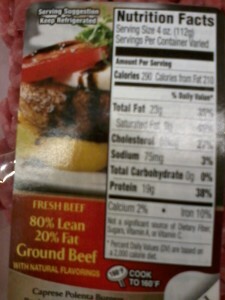 For example, the following illustration shows a package of ground beef that is only 20% fat. This may not seem like a lot until you realize that the percentage is not based on calories but on weight. If you look at the part of the label that says “calories that come from fat” you see that 270 of the calories comes from fat while the entire serving has a total of 290 calories. 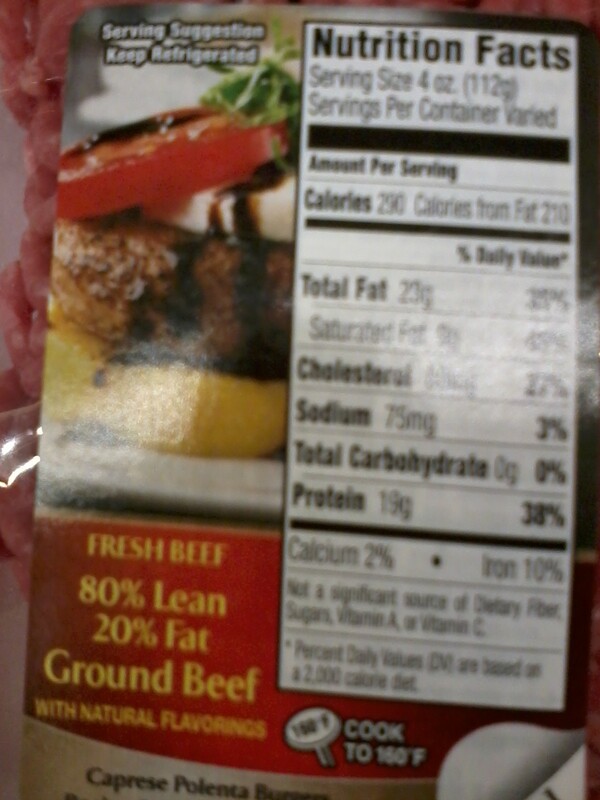 This pound of beef is not lean at all! I took this picture at the grocery store….. Many labels have large print that says they are “heart healthy” or “trans fat free” or “high in calcium” or some other vitamin or nutrient. These labels can be very confusing or misleading, making us believe that an item is very healthy when it may not be. This was brought to to the attention of the food and nutrition board in 2011 when food such as sweetened cereal, macaroni and cheese and ice cream had a smart choice label on it which was supposed to mean that the food was healthy for the heart. More legislation is trying to be passed to make food packaging more honest but it is an on going process. The best way of knowing if what you are eating is healthy is to get educated on proper diet and learn to read the nutrition section of the label and the ingredients. Do not judge a food by the front of its label. Another example of mislabeling is trans fat. A label might say “free of trans fat” when in fact, it does contain trans fat or hydrogenated oils. The reason the food might claim to be trans fat free is because, by law, they only have to reveal a certain amount of trans fat on the label. If its less than .5 grams, the company can get away with saying that it is trans fat free. It may not show up in the nutrition label but it will be on the ingredients list. Trans fat and hydrogenated fats or oils are the same thing. They are the least healthy form of processed fat and can contribute to coronary heart disease, damaged blood vessels and high cholesterol. Often a label will say trans fat free, when it does contain hydrogenated oils in the ingredient list so watch out for this trick. Also look out for labels that claim to be “whole grain.” A package may say this on the front of the label but when you look at the nutrition label, you might find that the fiber content is actually quite low. Look at the ingredients list. The most ingredients are always listed first and the minor ingredients are listed last. If the first ingredient is “whole grain” then you are getting just that. However, if the first ingredient is enriched white flour or something else and the whole grain is farther along, listed after white flour and other sugars, then you probably aren’t getting as much whole grain as you think you are. When looking at a nutrition label, look at the “amounts per serving” first. You might choose a box of crackers have very few calories but then you find out that one serving is only 2 crackers when you usually eat 10 crackers for each serving. This changes things. When comparing labels, always keep in mind how much a serving is because one brand might have 10 ounces as a serving while another has 20 ounces. Another thing to watch is when one unwanted ingredient replaces another. Say, you are on a low calorie diet and you see a package that is “fat free,” you might think that package has less calories. However, when I read labels, I often find that the fat free packages contain more sugar in them. Because of the added sugar, the calorie content does not change. In general, if the food is processed or cooked with many ingredients like a box of pastries, bread, soy milk etc., extra sugar may be added if the fat has been taken out. However, if you are buying whole foods such as meats or milk, the fat is skimmed off without sugar additives. Always read the nutrition label and ingredients list just to be sure. Many times a product might claim to be rich in a certain vitamin. For example, a cereal box might claim to be rich in vitamin D but when you compare nutrition labels, you learn that all products of cereal have the same amount of vitamin D added to their product. Many advertisers will pick out a fact that is true for all products, but make it seem like they are the only product that carries it.